to do a typical portrait of it. The composition including the background shapes are intended to create a work of art based on what I am viewing. This is one of world’s truly great designs and I tried my best to display that aspect of it and wanted to simply make a work of art of it. Wyss: Now the Aston Martin open roadster with its dual headrests, the one that you depicted from a rear view, on that one you have gotten pretty far away from the normal depiction of a car, into pure flowing shapes. I would say that for someone who doesn’t know about race cars with headrest fairings, it is pretty incomprehensible. Did you worry that, in this particular painting, you were going too far, pushing the envelope too far on what is recognizable, or what’s your philosophy on that? Hale: Again my intent is to create a work of art and I use the automobile to do this. I really don’t care that much as to whether the particular automobile is recognizable in the painting. In this case I wanted to make a pure and exciting work of art and simply used the forms in this automobile to accomplish that. The composition, the color, the reflections and the abstraction are what are important to me. This Aston Martin provided some incredible shapes allowing me to exaggerate color and reflections from a purely creative point of view. My process begins with numerous photographs that allow me to study the surfaces and details of the automobile (I do not paint from the photographs). I then create a fairly loose drawing as I realize that during the creation of the painting I will modify this drawing to make it appear correct. I begin the painting in an area of the canvas that initially appeals to me. I may work back and forth between the background and the subject realizing that ultimately, the painting must look right and exciting. My paintings are typically quite strong and what is most important to me is that I personally create my colors and all of the reflective shapes. I do not use photographs for this as I want the color and abstract shapes to be unique to me and not influenced by any other artist. Upon selecting a subject to paint, I am not influenced by how much time it will take to finish it. If I’m willing to seriously think and compose a possible painting then I will take whatever time it takes to create it. My process is not that fast as I continuously modify the abstract shapes, composition and color. The painting becomes a continual process and once I arrive at the finish and am satisfied, I no longer go back. I realize that I’ll never retrieve the emotions that I had during the initial process and so why go back? Wyss: On the yellow Jaguar, you reduced the color palette throughout to light yellow and complimentary shades of yellow. Do you sometimes feel certain cars and certain angles do well if you choose to depict them with minimal contrast? Hale: In this case with the Jaguar, I wanted to change my pallet to something light and airy. Light colors on an automobile often do not show many reflections as with a dark car. I wanted this challenge to see how I could handle colors that I don’t often use. My comments previously on color may not suggest that I actually like to explore a variety of colors and see if I can effectively handle them. In this case, with the Jaguar, I was pleased. Wyss: In your side view portrait of a prewar Packard, you went for fairly tight detail on the car but go to a complete abstract mood-setting in the background. What’s your philosophy on whether a car should have a realistic background or be completely abstract? It seems like a great many car artist feel the background has to be realistic if the car is realistic. dictated to some degree by the client and often a ‘picture’ of their car is required. 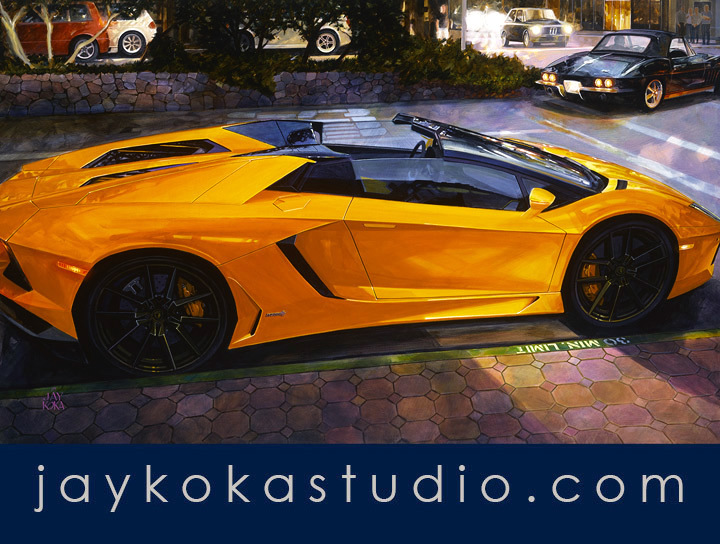 With my automotive paintings, I use the subject of the automobile to proceed to create a work of art. Color of the automobile doesn’t matter to me; a realistic background doesn’t matter; the correctness of the reflections on the surface doesn’t matter. What really matters to me is creating an exciting work of art. People sometimes ask me ‘what color is this car’? I tell them I don’t really know…or even care. 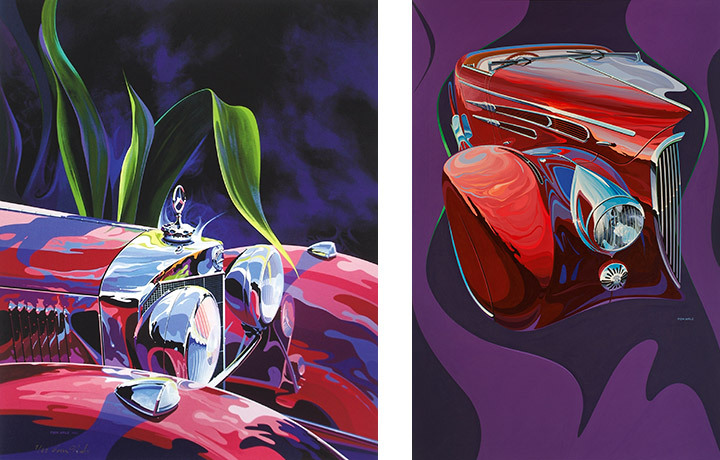 I try carefully to create the image of the automobile in a very real manner and yet highly creative with the use of colors and reflections. I then want to merge the background, however abstract, with the automobile to make a complete composition. This approach is very typical of most of my art. Wyss: The ’57 Olds painting is another one where the vibrant colors almost takes one away from the fact this is in fact a detail of a motorcar. It took me a few minutes to see the rear fender. The daring purple lines below the car further hype it up, as if that chrome laden car shape wasn’t voluptuous enough. 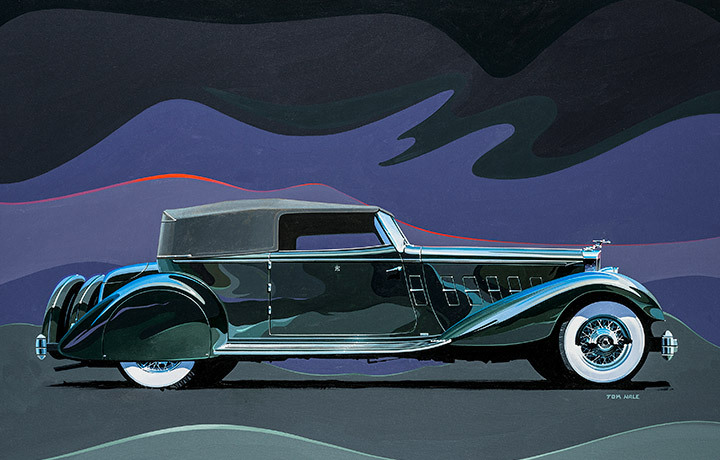 Do you feel that some cars are best represented with a painting that strikes more of a mood than just being a recognizable shape, in other words this painting is Bill Mitchell in the Fifties, trying to make Harley Earl happy? Hale: You’ll notice that I selected a detail view of one of my favorite areas of a 1957 Oldsmobile and I wanted it to appear somewhat abstract and immediately un-recognizable. 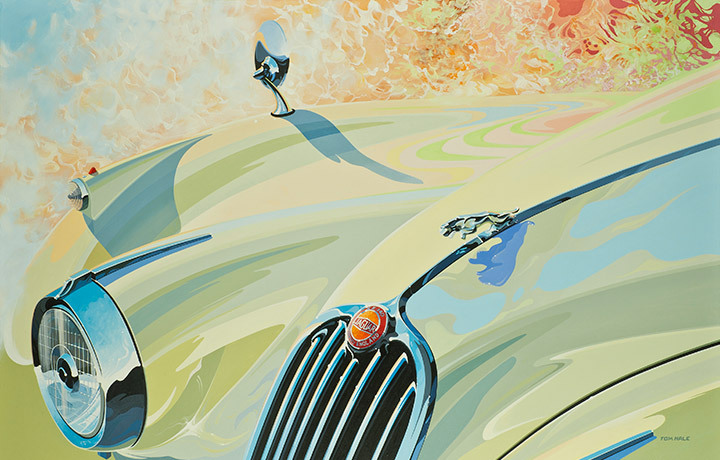 Cars of the 50’s had amazing vivid colors and so color was an important part of this painting. For the sake of clarity, I want the readers to understand that ‘design’ is an integral part of all of my paintings. As a Styling Designer for 20 years, I became very knowledgeable of surfaces and details and today, am able to depict them very easily and in a convincing way. You mentioned ‘mood ‘and this is exactly what I wanted with this painting. I want to thank you Wally for a very nice interview, I enjoyed it. I want to add just a few other thoughts. I absolutely love the process of creating a painting. To begin with a clean canvas and through the lengthy process of drawing, composing and painting and then witnessing the final result is very exciting for me. I paint in a traditional manner and absolutely do not use the computer, photoshop, photos or airbrush. My process is very simple in that I use a piece of matt board for my palette, a dish of water and pure acrylics without any mediums. Traditional art methods for me are real, beyond that does not interest me. I enjoyed my designer career but after 33 years of being a full time artist, I have loved my art career and the artists and people that I have met.